Review of Belcher: "THE CAVALRY OF THE ARMY OF THE CUMBERLAND"
Until recent decades, accounts of the exploits of eastern theater Confederate generals like J.E.B. Stuart and western raiders Nathan Bedford Forrest and John Hunt Morgan fairly dominated the subject of Civil War cavalry in the publishing world. Thankfully, numerous studies have now documented the mid-war emergence of Union cavalry in the eastern theater, and that arm of the Army of the Potomac can finally be regarded as having received its proper due. However, their western counterparts in blue remain neglected by comparison. By examining in depth the officers and units of the Union cavalry attached to the North's primary heartland army and their contributions to several critically important western campaigns, Dennis Belcher's The Cavalry of the Army of the Cumberland shines needed light on an overlooked group. The book is a deeply researched, finely focused, and richly detailed leadership, organization, and operations study of a formation that emerged from humble origins in November 1862 to grow to four full divisions by October 1864 (when the parent Army of the Cumberland was broken apart and dispersed). In addition to combing through more than 100 unpublished document collections from archives located all across the country, Belcher consulted a large body of unit histories, newspapers, government documents, and other publications. Using this material, the author was able to assemble valuable insights into a host of unsung Union cavalry officers like Robert Minty, Eli Long, Edward McCook, Lewis Zahm, and many others. The study's unit discussion also profiles individual regiments (the good and the bad). The key figure in Belcher's volume is David Stanley, the general officer responsible during the latter stages of 1862 for taking the badly understrength and disorganized group of mounted forces attached to the newly created Army of the Cumberland and quickly reorganizing, training, equipping, and expanding them. This impressively rapid turnaround ensured that the cavalry arm had the ability to turn in at least a creditable performance that winter during the Stones River Campaign. Key support for Stanley's reforms was provided by army commander William S. Rosecrans, whose incessant demands for horses, men, and the latest weaponry eventually taxed the patience of his superiors in Washington. Both men overcame administrative resistance to the creation of mounted infantry, a bureaucratic victory that would pay off in spades in ensuing campaigns, when the combat power of the mounted infantry proved decisive on multiple occasions. Belcher marks the 1863 Tullahoma Campaign as the moment when the Union army's western cavalry would finally match and frequently best their opponents. This same time period is often regarded as the eastern cavalry's turning point, as well. The book goes on to recount in great detail the mounted operations that accompanied the Chickamauga, East Tennessee, Chattanooga, and 1864 Georgia campaigns, but it also discusses a myriad of smaller raids and skirmishes that have generally escaped notice in the wider literature. 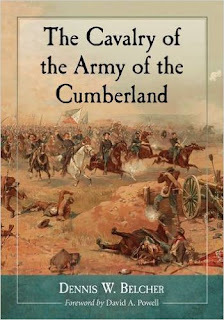 The cavalry of the Army of the Cumberland was never formally organized into a corps, though with multiple divisions it certainly became one in all but name. Two other generals, Robert Mitchell (very briefly in a temporary capacity) and Washington Elliot, followed Stanley as Chief of Cavalry but neither had much impact. The informal nature of the command arrangement often led army commanders to micromanage the affairs of the cavalry and interact directly with subordinates without going through their chief, both situations proving in several instances to be detrimental to the cavalry's effectiveness and well being. The bringing in of outside leadership at the divisional level, rather than promoting from within, also proved disruptive to the Army of the Cumberland's cavalry, with Robert Mitchell, John Basil Turchin, and eastern theater reject Judson Kilpatrick all proving to be significant downgrades from existing possibilities. Belcher ponders with good reason how much more the Cumberland divisions might have achieved under the command of talented and proven leaders like Robert Minty or Eli Long. Though the cavalry divisions generally performed well in their traditional role (guarding the flanks, screening the advance, and gathering information) during the 1863-64 campaigns, the book astutely documents their misuse, as well. While Stanley urged concentration and direct support of the infantry, Rosecrans favored dispersal and constant movement, the resultant wearing down of men and mounts credited by Belcher for being behind the army's critical failure to keep tabs on the enemy during the Chickamauga Campaign. The Army of the Cumberland cavalry has also been criticized for its performance during the 1864 campaign in Georgia, but Belcher's careful recounting of mounted operations between Dalton and Atlanta presents a different picture. Regarding the later stages of the campaign, the author persuasively argues that blame for the loss of a third of the cavalry strength of the army group during deep raids conducted south of Atlanta should primarily land at the feet of Sherman, who regularly misunderstood and mishandled his cavalry. In number and quality, the study's visual aids comprise a valuable supplement to the narrative. Along with an abundance of photographs, numerous original maps chart the activities of the cavalry during the many campaigns fought (there are some tactical scale maps, as well). In addition to strength numbers and casualty tables, the author also very helpfully inserts complete cavalry orders of battle at regular intervals throughout the book. A very useful combined order of battle is included as an appendix, too. 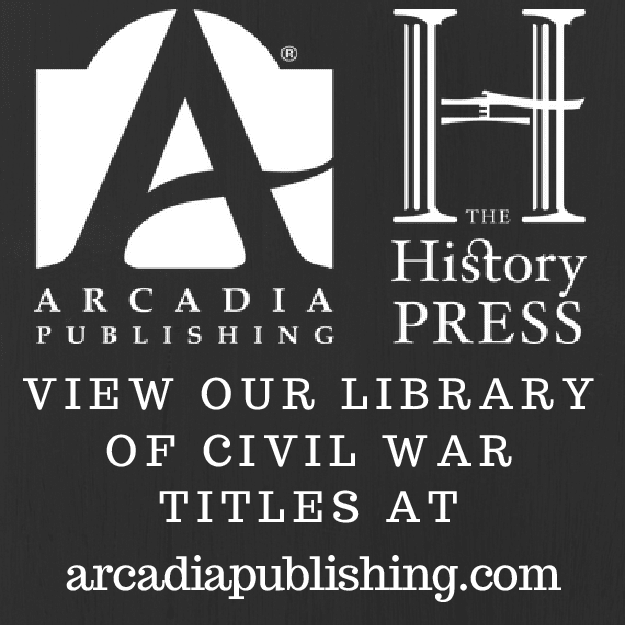 With the release of The Cavalry of the Army of the Cumberland, Civil War readers finally have a well researched and comprehensive record of the cavalry's contributions to Union victory along the western theater's central corridor. Belcher's study is both a freshly original narrative history and a beneficial reference tool. • Astride Two Worlds: Technology and the American Civil War edited by Barton C. Hacker (Smithsonian Inst Scholarly Pr, 2016). In nine essays (including an introductory chapter from editor Barton Hacker), this book "addresses the various causes and consequences of technological change for the course and outcome of the American Civil War." Part One includes chapters dealing with the Union small arms industry, heavy artillery, information systems, and equine veterinary care. Part Two looks at Confederate torpedo boats, personal body armor, Confederate measures aimed at spoiling Union balloon aerial reconnaissance, and early flying machine designs. A popular topic for Civil War armchair generals to tear their hair out over involves the general inability of armies (Union and Confederate) to effectively pursue beaten enemies. General histories deal with the subject in an anecdotal manner, and many campaign studies examine some of the salient difficulties involved, but Failure to Pursue: How the Escape of Defeated Forces Prolonged the Civil War by David Frey (McFarland, Dec 2016) is likely the first book entirely devoted to the war's pursuit/retreat dynamic. The publisher's description is brief, with the following key passage: "Taking a fresh look at the zero-sum tactics that characterized many major combat actions in the war, this book examines the performance of unsuccessful (sometimes insubordinate) commanders and credits two generals with eventually seeing the need for organized pursuit." How systematic (or analytical vs. merely descriptive) the author's approach will be is impossible to tell from the limited information available. I hope the book also looks at Civil War pursuit in the wider context of military history, as one suspects the annihilation of retreating forces to be far more rare across eras than popularly supposed. Napoleon is often cited as a particularly fine practitioner of the art of operational pursuit, but his epic hounding and destruction of the beaten Prussian Army during the 1806 campaign was hardly typical of the Napoleonic Wars [and maybe the current scholarship has shown even that to be exaggerated, I don't know]. Anyway, I am looking forward to reading what Frey has to say on the matter. • The Second Battle of Winchester: The Confederate Victory that Opened the Door to Gettysburg by Eric J. Wittenberg and Scott L. Mingus Sr. (Savas Beatie, 2016). This looks to be the 2nd Winchester study that will fulfill the most demanding expectations and stand the test of time. Wittenberg and Mingus "produce the most in-depth and comprehensive study of Second Winchester ever written. 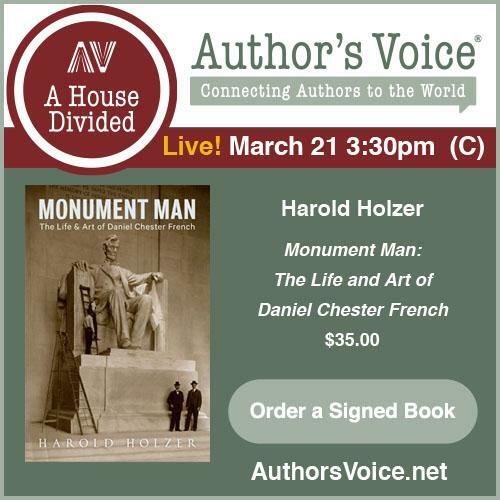 Their balanced effort, based upon scores of archival and previously unpublished diaries, newspaper accounts, letter collections, other firsthand sources, and a deep familiarity with the terrain in and around Winchester and the lower Shenandoah Valley, explores the battle from every perspective." It's a thick tome created from a massive body of primary source materials, with the main narrative approaching 450 pages. As we've come to expect from the publisher's ever growing line of major battle and campaign studies, maps are very plentiful. There's also a pair of driving tours (one for the immediate battle, and an extended version) along with detailed orders of battle. Army, Jr.: "ENGINEERING VICTORY: How Technology Won the Civil War"
No one would deny that the field engineering skills displayed by the Union Army during the Civil War, both by specialized units and by skilled officers and men of regular volunteer regiments, materially contributed to victory in countless campaigns, but Thomas Army takes this argument a step further in his book Engineering Victory: How Technology Won the Civil War. Given the Confederacy's supposed advantages in strategic imperative, terrain, and sheer land mass1 along with the similarities in training, tactical doctrine, and weaponry between contending sides, Army argues that the engineering prowess of the Union fighting man (combined with the engineering deficiencies of the Confederate Army) served as the key component of military victory. Army divides the book into three parts. Part I documents the knowledge and education gap between North and South as it specifically pertained to engineering, project/business management, and labor culture. The book looks at common school systems in the sections and concludes that northern reforms and financial support far outstripped those of the South. Northern states recognized early on that their burgeoning industrial economies required a supporting system of mechanical education in order to the provide the skilled labor pool needed, and Army perceptively points toward northern initiatives aimed at expanding the reach of knowledge transmission by way of not only university programs but also agricultural fairs, lyceums, and mechanics's institutes. While the slave system was a closed, top-down arrangement with little input (or personal motivation to increase productivity) from the workers themselves, Northern free labor fostered innovation at all levels, with many laborers striking out on their own after a time and applying improved methods (learned through experience along with trial and error) to new commercial concerns. The explosion of railroads in the North would also lead to the creation a large pool of skilled managers, engineers, mechanics, and artificiers, all of whom could be harnessed by the Union war effort. While Army's contention that great sectional disparities in mechanical, engineering, and scientific education existed in the antebellum U.S. is surely true, his widely shared view of a southern upper class actively suppressing access to public education has been somewhat contested by recent scholarship, among the most interesting being Sarah Hyde's work (to be published in book form later this year2) on public schooling in antebellum Louisiana, Mississippi and Alabama. Still, for the purposes of Army's engineering arguments, the fact remains that the South's public school system was aimed primarily at a classical education, with a science and technology emphasis greatly dissimilar in scale and breadth to the North's. Part II of Engineering Victory looks at the earliest Civil War applications of military engineering, during the 1861-62 campaigns in the eastern and western theaters. A major theme here is the forward looking recognition that the Union army's immense growth required a similar expansion in engineering capability, and meeting this challenge would require volunteer units staffed with civilian engineers and skilled laborers. The book documents the initial resistance of the army's professional engineers and their gradual (but never total) acceptance within their specialized field of the presence of volunteers. Army also selectively, yet effectively, contrasts the Union's early aggressive engineering efforts with the Confederacy's muddled ones. The author persuasively argues that, by the end of the 1862 Peninsula Campaign, the "the inability to establish an engineering bureau in Richmond, poor maps, few soldiers willing to labor on engineering projects, and no engineer battalion or regiment in any of the armies in the field" (pg. 129) hampered the effectiveness of Confederate armies during the first half of the war and beyond. More specific, and greatly more detailed, examples are the order of the day in Part III. In this section, Army astutely constructs case studies highlighting the prominent role military engineering played in the Vicksburg, Gettysburg, Chattanooga, Red River, Petersburg, Atlanta, and Carolinas campaigns. Most often centering around Union bridge construction, road building, canal construction, and railroad/logistics management (along with some siege techniques), Army's vignettes are well researched and well described but, mostly important, they very clearly and specifically link these engineering feats to the victorious outcomes of the campaigns (the Red River disaster being the salient exception). The Confederate side is not ignored in this part of the book, but it is very much pushed into the background. Army also frequently matches the Union at its best with the Confederacy at its worst, which might in some places serve to unnecessarily exaggerate disparities in engineering capability. The book rightly points to serious Confederate deficiencies in the areas of railroad management, reluctance to take troops out of the line in order to form engineer units, labor inefficiency, and other factors, but often seems overly critical of actual achievements. The author offers only grudging praise of Confederate combat engineering during the Atlanta, Overland, and Petersburg campaigns and is less than impressed with their efforts at Vicksburg. Additionally, the book's overall negligence of naval affairs in favor of land campaigns means the conversation misses out on Confederate technological innovations in the areas of heavy ordnance, ironclad warships, submarines, and torpedoes (nautical mines). Even for the campaigns mentioned, the author often fails to counter Union achievements with corresponding mention of important moments in Confederate engineering. A striking example relates to the 1864 Red River Campaign. Army rightly credits the wing dam system created by Union engineers with saving the fleet from being trapped above the falls at Alexandria, but he neglects to mention that the river's precipitous fall was largely the result of an ingenious feat of hydro-engineering on the part of the Confederates3. Nevertheless, the book makes a powerful case overall that the North out-engineered the South, even after taking into account vast differences between the sides in available finances, material resources, industry, and pools of skilled manpower. Engineering Victory documents in fine fashion the role of the mechanical arts and their skilled management in the Union triumph over the Confederacy. 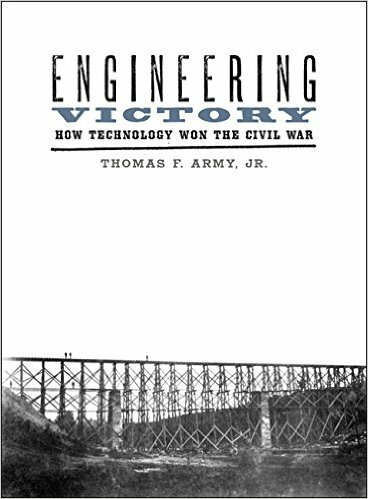 But was engineering really the singular tipping point in Union military victory that author Thomas Army believes it to have been (after all, engineering was one of many tools often wielded by federal forces to asymmetrical advantage during the war)? Those that grasp warfare's myriad of complexities are generally suspicious of such reductionist claims (and if they are not, they should be), but one can still appreciate the value of various well formulated arguments underlying a central theme while rejecting the headline conclusion4. A thoughtful treatise on an important subject related to war, culture, and society, Engineering Victory is highly recommended reading. 1 - While these factors are often construed as advantageous to the Confederacy, they could also be serious liabilities. Defending an immense land mass with most key cities (and many industries) located along the periphery meant that it was politically necessary that all these widely separated strategic points be protected at all times. Union leaders, on the other hand, could pick and choose where to attack, and the South's poorly maintained railroads seriously diminished the traditional advantage of interior lines. This geography also created a related strategic conundrum. That the Confederacy did not have to win a war of conquest, but only survive a defensive war on its home ground (which additionally consisted of a land mass great enough to afford the ability to trade space for time), seems advantageous on paper, but the reality was that the very outer areas yielded early in the war contained critically important cities and irreplaceable industrial capacity. Terrain is also often cited as a benefit to the Confederacy, but major rivers, especially in the west, were all too often less useful as defensive barriers to key strategic points and more useful as unbreakable all-weather Union invasion and logistical support avenues. They also served to divide vast contested areas into manageable sectors of Union occupation. 2 - Schooling in the Antebellum South: The Rise of Public and Private Education in Louisiana, Mississippi, and Alabama (LSU Press, Fall 2016). 3 - This aspect of the campaign remains little known among more general readers, but it has been prominently featured in the recent literature, most notably by historian Gary Joiner in his 2006 book Through the Howling Wilderness: The 1864 Red River Campaign and Union Failure in the West (University of Tennessee Press). 4 - Other examples might include Daniel Sutherland's book on the "decisive role" of guerrillas (A Savage Conflict, 2009) and Marc Egnal's study (Clash of Extremes, 2009) lending economic factors primacy in discussing the Civil War's origins. • Opposing the Second Corps at Antietam: The Fight for the Confederate Left and Center on America's Bloodiest Day by Marion V. Armstrong Jr. (Univ of Ala Pr, 2016). Having examined events from the Union perspective in Unfurl Those Colors: McClellan, Sumner, and the Second Army Corps in the Antietam Campaign (2008), author Marion Armstrong "now recounts in riveting detail Lee’s command decisions and their execution in the field, drawing on a superlative collection of first-person accounts by Confederate veterans..."
"Armstrong sets the stage with a lively recap of the political and military events leading up to the early fall of 1862 and foreshadowing the conflagration to come on September 17. Each chapter then traces a critical section of the battle, the fight for the West Woods and the bloody engagement of the Sunken Road. Armstrong augments this collection with an exceptional set of maps, which will be valued by scholars, readers, and visitors to the battlefield. These unique maps delineate troop movements in intervals as brief as fifteen minutes, ..."
I didn't get a copy of Unfurl Those Colors but recall it being pretty well received at the time. • They Fought for the Union: A History of the First Delaware Volunteers in the Army of the Potomac by Jeffrey R. Biggs (Belli Civilis Pr - Author, 2016). The First Delaware largely flew under the radar during its initial twelve months of service. It first gained national recognition at Antietam, then fought in most of the Second Corps's major battles from that point until the end of the war in the eastern theater. Even though there has been a substantial upsurge in Border State scholarship in recent years, tiny Delaware remains largely overlooked. Biggs's new unit history aims to give the 1st regiment its just due. "They Fought For the Union revisits these border state soldiers through a wealth of untapped sources, personal accounts and soldier's diaries while always placing these conflicted soldiers into the larger context of the Army of the Potomac's struggles in the Eastern Theatre of the war." Self-published, it nevertheless looks better than many of the professionally put together Civil War books we see today, and (at nearly 450 pages of narrative) its treatment of the unit's wartime service appears quite comprehensive. Included are a number of maps, mostly modified from archival originals. Earl Hess is the winner of the 2016 Tom Watson Brown Award presented to the author(s) of the previous year's best book "on the causes, conduct, and effects, broadly defined, of the Civil War" for Civil War Infantry Tactics: Training, Combat, and Small-Unit Effectiveness. Sharp readers will also recall that it was the CWBA Book of the Year, as well, an award of matching prestige but 50K less in prize money. • Gettysburg National Military Park by Jared Frederick (Arcadia Pub, 2016). This pictorial history of GNMP is part of Arcadia's Images of Modern America series. "Exploring the fascinating issues of historical memory, preservation, and popular culture," the book uses both B&W and color photography to trace the ongoing evolution of the park, from the post-WW2 boom in historical tourism to today. • The Chickamauga Campaign - A Mad Irregular Battle: From the Crossing of Tennessee River Through the Second Day, August 22 - September 19, 1863 by David Powell (Savas Beatie, 2016). Another paperback reprint from S-B. I reviewed this very fine title back in 2015 [see here] but still haven't gotten to Vol. II yet with Vol. III already set for release later this year. The content should be the same in the reprint, but I believe the publisher's paperback editions routinely fix errors that made it into the hardcover predecessors. 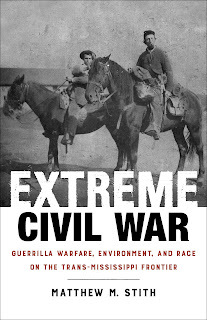 Stith: "EXTREME CIVIL WAR: Guerrilla Warfare, Environment, and Race on the Trans-Mississippi Frontier"
With the horrific and well documented excesses of the wars of the twentieth century serving as the benchmark for many when describing mankind at its worst, most observers are loath to place the American Civil War in the same category. However, there were pockets of Civil War conflict that did approach what some might call "total war," and one such area is examined in historian Matthew Stith's Extreme Civil War. Instead of once again revisiting the bloody lower Kansas-Missouri border, Stith's study shifts the nexus of people and events southward in a fresher direction to encompass not only those sections of Kansas and Missouri but also large swaths of NE Indian Territory and NW Arkansas. If ever there was a true Civil War "no man's land", one with a near complete breakdown of society, commerce, law, and order within its boundaries, it was this rugged and largely underdeveloped borderland shared by Kansas, Missouri, Indian Territory and Arkansas. In Extreme Civil War: Guerrilla Warfare, Environment, and Race on the Trans-Mississippi Frontier, Stith traces the near absolute disintegration of a frontier border society only recently placed on the road to prosperity. Railroads were still absent from the region in 1860, but white settlements and some industrial developments (like the lead mines at Granby) were prospering and tribes traumatically resettled to the Indian Territory (like the relatively populous Cherokee) were regaining their footing. As the book amply shows, the war dramatically halted this shared growth and progress, changing all of it for the worse. As Daniel Sutherland and Clay Mountcastle persuasively demonstrated in their recent breakthrough studies of the irregular Civil War, Stith reveals that all the elements of what would come to be known as "hard war," including the targeting of civilians, were present on the Trans-Mississippi's western border from the conflict's earliest moments. Although the regular forces of both sides traversed the area on an infrequent basis (and Union garrisons permanently occupied key points), the guerrilla war was the war for the vast majority of the civilian population, one often characterized by daily terrors. As Stith notes, attacks by southern sympathizing guerrillas only encouraged harsher and more indiscriminate Union measures aimed at controlling the population and eradicating bushwhackers. Sutherland's view (in A Savage Conflict) of guerrilla warfare as generally counterproductive to Confederate national interests (in a military sense as well as in alienating the civilian population) is well borne out by Stith's research regarding this particular region. Routinely engaging in the same brand of murder, arson, and robbery, the Union occupiers did not enhance their own case as upholders of social justice and order. In exploring this widespread terrorization of non-combatants, Stith reaches deep into the archives, with every facet of his book enriched by firsthand accounts written by soldiers and civilians from both sides. Some are penned by figures familiar to students of the Civil War in the Trans-Mississippi but many are not. By the war's midpoint, society at the western edge of Trans-Mississippi settlement had devolved into the kind of nihilistic free-for-all that Michael Fellman described so vividly in Inside War, his classic study of Missouri's guerrilla conflict. A natural response to this scale of human disaster is to flee, and Stith's book also documents well the refugee crisis (white, black, and Indian) that engulfed the region, one that depopulated entire areas and often overpowered the civilian aid resources of Union military authorities. In terms of death, desolation, and displacement, Stith's study reinforces arguments put forth by previous scholars (most recently by Clarissa Confer, Mary Jane Warde, and others) that the tribes residing in Indian Territory suffered more than any other segment of American society from the ravages of the Civil War, ironically a conflict none of them wanted in the first place. The war's connection with the environment, both in terms of the natural surroundings and attempts by both sides to alter (or take advantage of) existing terrain, is another important theme of Extreme Civil War. Bruce Nichols's colossal four-volume history of Missouri's guerrilla conflict perhaps best illustrates the seasonal nature of that mode of warfare in the state, and Stith's findings clearly suggest that the phenomenon held true in other parts of the Trans-Mississippi. With refugees of all races pouring into Union safe havens in Kansas and elsewhere, depopulation meant an explosion of the feral hog population and the return of wildlife, ironically increasing the available food supply for foraging soldiers and guerrillas. As part of their counterguerrilla strategy, Union soldiers and militia also set fire to forest land in an unsuccessful attempt to rob enemy bushwhackers of their cover. Non-combatants sought to alter their surroundings, as well. As an act of self-preservation, pro-Union civilians who wished to remain in the region sometimes banded together into fortified farm colonies, their stockade defenses and armed guards deterring both bushwhackers and less discriminant Union army foragers seeking easy targets for supplies and plunder. Weather also played a role in how the irregular war was fought. The winter of 1863-64 was the coldest in two decades and an extended drought meant that supply ships could not reach Union garrisons situated along the upper reaches of the Arkansas River. Coinciding with the period when the guerrilla conflict was at its worst, these factors severely limited the distance Union military expeditions could operate from their bases and also meant the needs of suffering refugees could not be met. Was this frontier indeed where the Civil War was at its most "extreme"? With the region's civilian population already living a precarious existence before being targeted by the armed supporters of both sides and subjected to daily terrors (including the very real threats of murder, torture, robbery, and arson) that only increased in frequency as the war progressed, one is hard pressed to imagine a worse situation for non-combatants. While certainly a more rare occurrence, even women could not escape the worst of fates in this lawless frontier. From the evidence provided in Stith's book, an argument can certainly be made that all of this, combined with an unforgiving environment, did indeed create the Civil War's closest approximation to a "total war." In recent years, there's been an explosion of scholarly interest in contested Civil War borderlands, especially involving areas touching Missouri, Kentucky, and (West)ern Virginia. By directing its own focus much more to the west, to a Trans-Mississippi frontier that encompassed Indian Territory and the bleeding edge of the harshest brand of hard war experienced by both sides, Extreme Civil War considerably expands the geographical area under consideration by border war scholars and enhances our understanding of just how frightening and deadly the war could be for civilians The book also succeeds in making meaningful connections with newer branches of study (like environmental history). 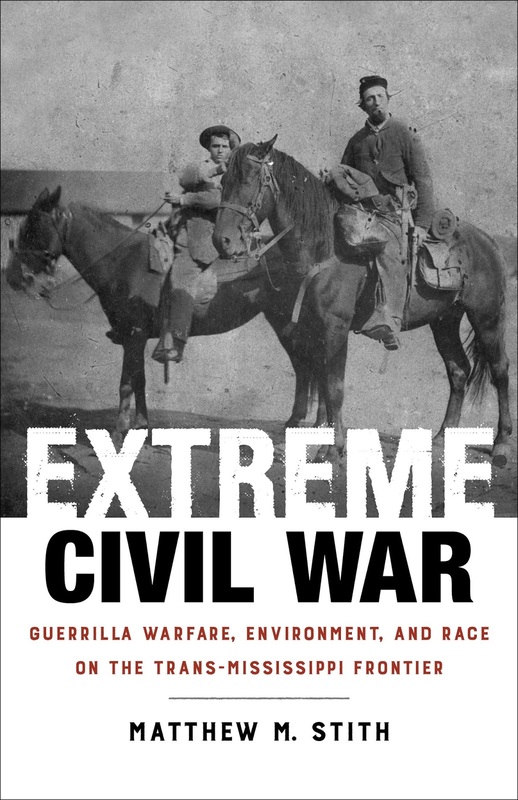 For all the reasons stated above, Extreme Civil War is highly recommended reading. • John Bell Hood: The Rise, Fall, and Resurrection of a Confederate General by Stephen M. Hood (Savas Beatie, 2016). The publisher has just released a paperback edition of John Bell Hood, which won the Albert Castel and Walt Whitman book awards. I didn't review it on the site, but I read most of it and remain impressed with the power of the great majority of its indictments of the Hood scholarship of the past century and a half. Like many books that attempt to significantly revise deeply entrenched conventional thought, the polemical tone can be abrasive at times and some conclusions overreach the evidence, but that didn't bother me too much as the study as a whole is more than solidly grounded. Popular opinion changes slowly, if at all, and it will be interesting to see if views on Hood change much over the next decade and beyond. If you missed it the first time around, pick up a copy and bring an open mind along for the ride. • The Civil War: Great Speeches and Documents edited by Bob Blaisdell (Dover Publications, 2016). Civil War related document anthologies are published every year and the amount of thoughtfulness that goes into them varies widely. Blaisdell's 57 selections are not just a rehash of famous speeches and documents. Some will indeed be very well known to readers, but there's also a healthy set of fresher material. Among the many document types included are official reports, court records, government proclamations, public addresses, military reports and dispatches, diary and journal excerpts, and letters. 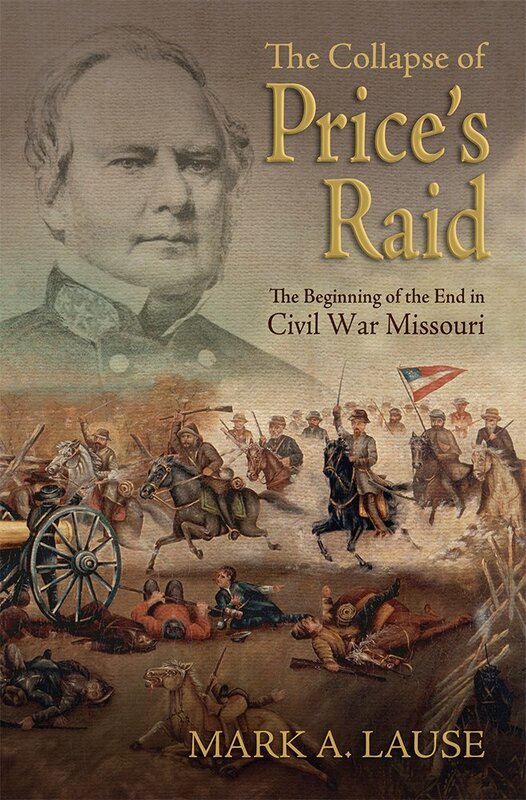 Lause: "THE COLLAPSE OF PRICE'S RAID: The Beginning of the End in Civil War Missouri"
Mark Lause's Price's Lost Campaign: The 1864 Invasion of Missouri (2011) concluded with no indication that a second volume was forthcoming. However, it didn't take long for interested readers to learn that a follow up study that would take the operation to its conclusion was in the works. Released earlier this year, The Collapse of Price's Raid: The Beginning of the End in Civil War Missouri continues the narrative from a natural turning point, when the Confederate campaign switched over from one of conquest (or liberation, depending on one's point of view) to that of a raid, albeit on a much larger scale than those previously conducted in the state at regular intervals throughout the war. To modern observers, the 1864 Missouri Campaign seems doomed from the start, but the campaign's conversion to a raid became inevitable when Confederate forces failed to capture any key point of political and/or strategic significance (like St. Louis or state capital Jefferson City) and the popular uprising envisioned by the most optimistic (or delusional) Confederate partisans did not occur. The book's promotional description positions it as a work heavily focused on the social and political context of the campaign, but description and analysis of military events are what really predominates. Lause's study recounts what essentially was one long running battle fought westward across the state (between Jefferson City and Kansas City) and then south through eastern Kansas and Indian Territory before finally returning to Arkansas. Lause describes Missouri River Valley skirmishes great and small (including those at Boonville, Glasgow, Sedalia, and Lexington), all of which set up the campaign's great sprawling battle around Westport, with fighting at the Little Blue River, Independence, the Big Blue River, and Brush Creek (a stream located a short distance south of the town of Westport itself). Actions fought during the retreat (at the Marais des Cygnes River, Mine Creek, the Marmiton River, and at Newtonia) are also briefly discussed. Some of Lause's battle descriptions, like those sections of the book covering Brush Creek (the heart of what most people consider the Battle of Westport), are quite good but they suffer from the fact that superior accounts were published less than nine months earlier in Kyle Sinisi's The Last Hurrah: Sterling Price's Missouri Expedition of 1864. But that's not to say they lack items of unique interest. One of Lause's most intriguing contentions is that the strength of the Union Army of the Border (particularly Kansas State Militia numbers present at Westport) has been vastly exaggerated in prior histories. Most historians place KSM numbers alone at 10-15,000 men, but Lause has determined that less than 5,000 were actually present during the fighting. If accurate, this shortens the odds between contending forces considerably and makes the Battle of Westport a less quixotic affair from the Confederate perspective. One great omission stands out like a sore thumb, though. Books cannot be blamed for being victims of timing, but self-inflicted wounds are another matter entirely and Collapse commits a grave one by having no maps. Unlike some earlier writers, Lause avoids grand pronouncements about the operation having a major effect on national elections or that it significantly prolonged the war. On the subject of analyzing the performances of opposing leaders, there is more agreement. The author's assessment of Sterling Price's conduct of the campaign is unequivocally negative. Lause follows in the footsteps of others in criticizing the size of Price's wagon train of loot (the true scale of which has come under renewed debate) and reluctance to part with it. The two Union military departments (Missouri under William S. Rosecrans and Kansas under Samuel R. Curtis) were more distrustful than cooperative. Rosecrans and chief subordinate Alfred Pleasonton were unduly cautious in their pursuit of Price across Missouri and failed to make any reasonable attempt at cutting off the retreat of the Confederate army. Curtis had gather his own forces quickly, all the while negotiating a political battle with Governor Carney of Kansas (who was extremely reluctant to call out the militia, discounting the Confederate threat until it was almost too late) and an uncooperative Rosecrans. James G. Blunt was Curtis's most aggressive instrument, but the early abandonment of the pursuit by Rosecrans and Pleasonton meant rendered Price's complete destruction out of the question. The book is largely presented from the point of view and perspective of the Union side. Much of this can be attributed to source availability, but selection plays some role, too. Neither Lost Campaign nor Collapse contains a bibliography, but a perusal of the endnotes in Collapse reveals three bedrock sources for its narrative: the Official Records [Union reports always outnumber those of the Confederates in the O.R. but the disparity is even more pronounced here, which isn't surprising given the nature and outcome of the operation as well as its late date], the St. Louis Missouri Democrat, and Kansas officer Richard Hinton's classic memoir Rebel Invasion of Missouri and Kansas and the Campaign of the Army of the Border Against General Sterling Price in October and November 1864. In terms of source type, they certainly are representative of three pillars of modern Civil War scholarship (official government documents, newspapers, and letters/diaries/memoirs written by participants), but, in this case, neither of the latter two could be described as anything but partisan. In spite of the reservations mentioned above, Lause's two-volume set (Price's Lost Campaign: The 1864 Invasion of Missouri and The Collapse of Price's Raid: The Beginning of the End in Civil War Missouri) is still worth reading and keeping around on the bookshelf. But given the current improved state of the literature of the 1864 Missouri Campaign, it is this reviewer's opinion that most of the scholarship value going forward resides in the first book. As far as I know, no one has previously attempted a standalone history of the Army of Virginia, the amalgamated Union army [three corps: First (Sigel), Second (Banks), and Third (McDowell)] that was formed in central Virginia in the summer of 1862 after the failure of the Peninsula Campaign and placed under the command of western rising star John Pope. John Matsui's The First Republican Army: The Army of Virginia and the Radicalization of the Civil War (Virginia, Sept 2016) draws "on archival sources from twenty-five generals and 250 volunteer officers and enlisted men" and "offers the first major study to examine the ways in which individual politics were as important as military considerations to battlefield outcomes and how the experience of war could alter soldiers’ political views." Matsui supports some interesting arguments. "If the Army of the Potomac (the major Union force in Virginia) was dominated by generals who concurred with the ideology of the Democratic Party, the Army of Virginia was its political opposite, from its senior generals to the common soldiers. The majority of officers and soldiers in the Army of Virginia saw slavery and pro-Confederate civilians as crucial components of the rebel war effort and blamed them for prolonging the war. 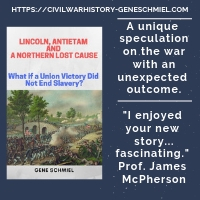 Ultimately, the frustrating occupation experiences of the Army of Virginia radicalized them and other Union soldiers against Southern rebellion and slavery, paving the way for Abraham Lincoln to issue the Emancipation Proclamation." I don't know. Skimming the Army of Virginia's order of battle, I don't see an exceptionally great preponderance of "radical" leaders and find it difficult to imagine the native born soldiers in the ranks of the three corps being the "political opposite" of their Army of the Potomac comrades in mid-1862. But, hey, I didn't do the research and am definitely intrigued by the notion of having my assumptions challenged on this. • The Terrible Indian Wars of the West: A History from the Whitman Massacre to Wounded Knee, 1846-1890 by Jerry Keenan (McFarland, 2016). "This history of the Indian Wars of the Trans-Mississippi begins with the earliest clashes between Native Americans and Anglo-European settlers. The author provides a comprehensive narrative of the conflict in eight parts, covering eight geographical regions—the Pacific Northwest; California and Nevada; New Mexico, the Central Plains, the Southern Plains; Iowa, Minnesota and the Northern Plains; the Intermountain West, and the Desert Southwest—with an epilogue on Wounded Knee." An oversize (7x10) volume coming in at over 500 pages of smallish print, this is a large book with encyclopedic coverage of nearly a half century of Trans-Mississippi U.S.-Indian conflicts. It looks like it has the makings of a valuable reference guide. Unfortunately, illustrations of any kind are sparse and there's only one map. • Sons of the White Eagle in the American Civil War: Divided Poles in a Divided Nation by Mark F. Bielski (Casemate, 2016). When it comes to Civil War connections with non-Anglo Europe, two very large groups of contributors (the Irish, and to a lesser extent the Germans) dominate the literature. Now it is the turn of Poles to grab some of the spotlight. Mark Bielski's book features nine transplanted Poles who served in the Union and Confederate armies. "The first group had fought in the 1830 war for freedom from the Russian Empire. The European revolutionary struggles of the 1840’s molded the next generation. The two of the youngest generation came of age just as the Civil War began, entered military service as enlisted men and finished as officers. Of the group, four sided with the North and four with the South, and the other began in the Confederate cavalry and finished fighting for the Union side. All but one came from aristocratic backgrounds." Most readers will have at least heard of Adam Gurowski, Wlodzimierz Kryzanowski, Joseph Karge, and perhaps Valery Sulakowski, but Bielski's book also directs our attention toward more obscure figures like Gaspard Tochman, Ignatius Szymanski, Ludwik Zychlinski, Peter Kiolbassa, and Leon Jastremski. If you have a Civil War friend whose last name ends in -ski or -wicz, you now have a great gift idea. • Amiable Scoundrel: Simon Cameron, Lincoln's Scandalous Secretary of War by Paul Kahan (Potomac Books, 2016). I don't "know" much about Simon Cameron's life and political career beyond broad brush strokes regarding his role in the emerging Republican party, his brief (and undistinguished) stint as Lincoln's first Secretary of War, and his reputation for mass corruption. According to Paul Kahan in his new full biography of Cameron, much of this conventional wisdom isn't really true. It looks like Amiable Scoundrel sets out to balance the books on a misunderstood man. The book description offers tantalizing hints at what lies within. Apparently, Kahan's research uncovered no direct evidence linking Cameron with corruption, and the author further believes that the secretary deserves more credit as "a key figure in designing and implementing the Union’s military strategy." Kahan mined Cameron archives at several locations and also consulted a large body of published primary and secondary sources. It probably disappoints some CWBA readers that I don't feature more biographies, but I definitely plan on reviewing this one. Ray, ed. 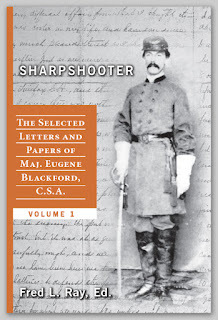 : "SHARPSHOOTER: The Selected Letters and Papers of Maj. Eugene Blackford, C.S.A. - Volume 1"
The Blackford clan out of Fredericksburg and Lynchburg, Virginia was a prominent, if not terribly wealthy, family that contributed five brothers to the Confederate cause. Historian Robert K. Krick's introduction outlines the many literary contributions of the soldier Blackfords and makes a strong case for their distinction as one of the first families of Confederate letters. W.W. Blackford's memoir War Years with Jeb Stuart (published in 1945) is an enduring classic and brother C.M. Blackford's Letters from Lee's Army is similarly useful to those researching the men and battles of the Army of Northern Virginia. Three other brothers, artillerist L.M Blackford, engineer B.L. Blackford, and 5th Alabama infantry officer Major Eugene Blackford also made significant contributions in their own right to Civil War historiography. It is the collected writings of the last that comprise Sharpshooter: The Selected Letters and Papers of Maj. Eugene Blackford, C.S.A. - Volume 1, edited by Fred L. Ray. 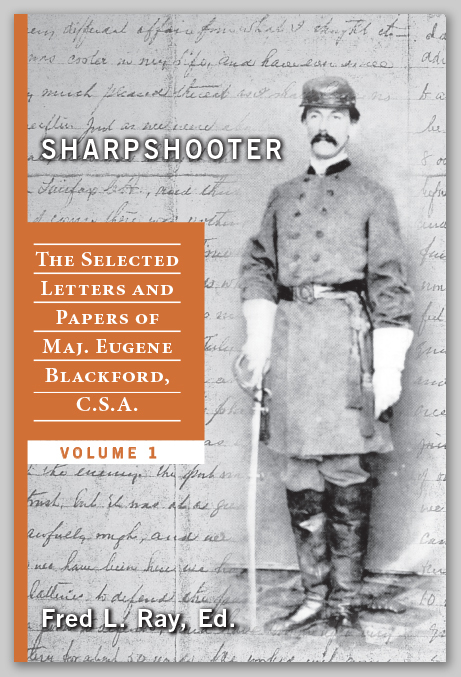 Readers may recall this particular Blackford as an important figure in Ray's pioneering study of the sharpshooter battalions of the Army of Northern Virginia, Shock Troops of the Confederacy (2006). In that earlier book, Ray leaned heavily on Blackford's large body of surviving papers, and the author has now embarked on a three-volume project to bring these valuable primary source materials to print. Volume I begins in January 1861, when Blackford found himself teaching in Alabama. Expressing political beliefs typical of Upper South conditional Unionists, Blackford was dismayed by the rabid secessionist spirit celebrated in Alabama (and more than a bit angered at the Deep South's smug confidence that Virginians would be dragged into the Confederacy whether they wanted to or not). He rigidly believed that any attempt by the federal government to return the seceded states to the Union fold by military force, a situation that would undoubtedly turn his home state into a "perfect Flanders," was unacceptable and would sever Virginia from the old Union. Prior to Sumter, Blackford remarks over and over in his letters how residing in Alabama felt like living in a foreign country and how little brotherhood he felt with the Cotton States. To what degree this oft expressed disdain toward the Deep South and its people resulted from stereotypical Virginia pride is impossible to know, but it clearly wasn't enough for Blackford to abandon his new home. While some of the prominent people in his town exhibited the same degree of mistrust toward him, Blackford was eventually convinced to lead a company of Alabama volunteers. After Fort Sumter was captured, the unit entrained for Richmond and was assigned to the 5th Alabama of Robert Rodes's brigade. In his letters, Blackford describes the retreat to the Virginia Peninsula and the fighting along the Yorktown line in some detail. His regiment was not engaged at the Battle of Williamsburg. During the great army reorganization of Spring 1862, Blackford was outmaneuvered for higher office. His description of the new regimental elections, which saw all of the other experienced captains replaced and the new lieutenants equally green to their duties, makes one wonder how much better the Army of Northern Virginia might have performed during the Seven Days had this democratic policy not been enacted. On the other hand, the failure to crush the Army of the Potomac on the Peninsula was much less about the fighting skill of the regiments and more about upper level command and staff breakdowns. Several letters describe Blackford's experiences of Seven Pines, Gaines's Mill, and Malvern Hill. The level of destruction in his home state depressed him. The human carnage of the Seven Days also deeply affected the young man, as Blackford often remarks to his family how painful it was to relate many details of the fighting. After Malvern Hill, Blackford was promoted to major but he also contracted typhoid fever, which incapacitated him for an extended period of time. During his convalescence, he additionally suffered from persistent swelling in one leg, which required him to use crutches (and miss the Maryland Campaign). Against medical advice, he rejoined the army at Fredericksburg. Chapter 7 includes a wonderful letter, perhaps the longest in the entire collection, recounting what Blackford and his regiment experienced at Fredericksburg. Though in reserve during most of December 13, his division (D.H. Hill's) relieved the front line after the fighting. Blackford details the action along the picket line (including truce negotiations) and also his inspection of the property damage inflicted by the battle, the latter especially affecting given his family connections to the town. It is in a January 1863 letter home while in winter camp near Fredericksburg that Blackford first mentions being placed in charge of a five-company battalion of sharpshooters made up of select volunteers from Rodes's brigade. While not especially detailed, the letter does provide some insight into specialized drill. The men of the battalion generally practiced deploying in open order on a half-mile front, with all orders transmitted by bugle. Blackford's Chancellorsville letters offer a fairly substantial account of the battalion's actions during that battle. His sharpshooters screened the flanking march of Jackson's corps and were positioned on the right of the brigade during the famous May 2 attack that crushed the Union right flank. The battalion also reconnoitered the Union breastworks located along Rodes's divisional front just prior to the Army of the Potomac's escape across the river. Curiously, Blackford only mentions Jackson's death in passing and doesn't express any particular regret over the loss beyond conjecturing that Jackson would have performed better than replacement J.E.B. Stuart did on May 3. The volume ends with the army preparing to march north. In his editorial capacity, Ray pens an introduction and epilogue for each of the book's ten chapters, as well as many brief transitional pieces within. A number of maps (including some interesting period sketches), photos, and drawings are also present. A fine essay in its own right, Krick's introduction convinces readers of the outsized historiographical impact of the Blackford family. Ray's chapter notes clarify persons, places and events mentioned in Blackford's letters. In terms of number and expansiveness, the notes occupy a solid middle ground between minimalist and delightfully obsessive. It should be mentioned that there is some degree of selective bias involved in the material collection, with an editorial preference for Blackford letters clustered around major battles and events. Given that Ray already committed himself to a large scale multi-volume publishing venture, one might reasonably question why the editorial decision was made to not include all the letters from 1861-62. With Blackford's writing totaling 300,000 words, this decision appears to have come down to economy and balance (the 1861-62 letters being by far the most numerous). The value of a particular set of Civil War letters is often exaggerated by reviewers, but Eugene Blackford's voluminous missives are far more articulate and informative than those typically found among the Civil War literature's large yearly output of published correspondence. These are rendered even more valuable given their author's key role in the development of a Confederate tactical innovation that has only recently been appreciated. Sharpshooter (Volume 1) is highly recommended, but it is only the beginning. The Confederate sharpshooter battalions of the Army of Northern Virginia would come into their own later in the war, and there is little doubt that the final two volumes will explore the organization and service of Eugene Blackford's battalion in even more depth. • The Civil War on the Mississippi: Union Sailors, Gunboat Captains, and the Campaign to Control the River by Barbara Brooks Tomblin (Univ Pr of Kentucky, 2016). I liked Tomblin's Bluejackets and Contrabands: African Americans and the Union Navy (2009). Her new book offers naval accounts of the Mississippi River campaigns that captured Island No. 10, New Orleans, Memphis, Vicksburg, and Port Hudson, while also covering Arkansas Post and the Twin River operation that led to the fall of forts Henry and Donelson. Scholars are always lamenting the paucity of surviving sailor diaries and letters (and there isn't a particularly large number in the bibliography of this study either) but from the book description they appear to be a large part of Tomblin's focus. "Drawing heavily on the diaries and letters of officers and common sailors, Barbara Brooks Tomblin explores the years during which the Union navy fought to win control of the Mississippi. Her approach provides fresh insight into major battles such as Memphis and Vicksburg, but also offers fascinating perspectives on lesser-known aspects of the conflict from ordinary sailors engaged in brown-water warfare. These men speak of going ashore in foraging parties, assisting the surgeon in the amputation of a fellow crewman's arm, and liberating supplies of whiskey from captured enemy vessels. They also offer candid assessments of their commanding officers, observations of the local people living along the river, and their views on the war." • The Confederacy at Flood Tide: The Political and Military Ascension, June to December 1862 by Philip Leigh (Westholme, 2016). Many Civil War scholars and writers have framed the period encompassing the summer and fall months of 1862 as the "high tide" of the Confederacy. Leigh's slim volume closely focuses its attention upon this brief time of apparent Confederate resurgence after a demoralizing series of defeats suffered earlier in the year. The book begins with the Seven Days battles and covers all three major theaters of war. According to the author "on every battlefront and in the governmental halls of Europe, the Confederate effort reached its furthest extent during the second half of 1862. But with the president’s [Emancipation] proclamation, the possibility of slave revolts and decline in the production of the very products that were sustaining the Southern economy became real; coupled with Europe’s decision to reject Confederate overtures and halt the sale of the ironclads, the opportunity for Confederate success ended." Barnes, ed. by Shannon: "CAMPAIGNS OF THE 20TH IOWA INFANTRY: With Personal Reminiscences of the War"
Between January 1, 1887 and March 11, 1888, Civil War veteran Joseph Danforth Barnes of Company K, 20th Iowa Volunteer Infantry contributed 66 separate articles about his Civil War experiences to an Illinois newspaper, the Port Byron Globe. These articles are compiled in Campaigns of the 20th Iowa Infantry: With Personal Reminiscences of the War and edited by M. Lawrence Shannon. Unfortunately, Mr. Shannon passed away before publication, but his wife, Pauline, stepped in to complete the project. Even though written two decades after the war ended, Barnes's newspaper recollections of the 20th's Civil War service, and his own personal role in the war, are valuable documents. The 66 articles fill almost 300 pages of text in the book, so there's a great deal of detail in them regarding comrades and their fates, personal encounters with major historical personages, campaign and battle vignettes, and more. In terms of campaign descriptions, the most impressive collection of articles is related to the writer's firsthand knowledge of the 1862 Prairie Grove Campaign (including the Van Buren Raid that followed it). In addition to relating details of the battle itself, Barnes spends a great deal of time on the plight of the wounded during the battle's immediate aftermath. He also offers an interesting perspective on what it was like on the far left flank of the Vicksburg siege lines (the quietest sector, and thus the least written about in most general histories). His account of the 1863 Rio Grande Expedition should also be of great interest to students of the Civil War in the Trans-Mississippi, especially the parts regarding garrison duty on Mustang Island (the writer's self-described most pleasant wartime interlude) and events from the war along the U.S.-Mexican border near Brownsville. The book's account of the final assaults on the forts guarding Mobile in 1865 is worthwhile reading, as well. Barnes claimed to have written his memoirs from memory, but it's readily apparent to the reader that, given the volume of intricate battle details (like who fell and where) contained in the articles, he must have used notes. He also consulted other sources. For instance, the Prairie Grove sections include not only the memoir of Barnes but also official reports and a lengthy account written by one of General Herron's staff officers [this officer is unfortunately unnamed, and the notes do not offer any additional information]. While his point of view is valuable, Barnes does often engage in the typical rhetoric of soldiers, exaggerating victory and massively overestimating enemy numbers and losses while minimizing those of his own side. There's definitely a strong vein of seriousness coursing through the recollections of Barnes, but the writer also strove to entertain. Early on, he tells of an encounter with "Wild Bill" Hickok and relates a tall-tale of Bill's that's clearly dime novel material. Barnes also apparently was a believer in the mythology of Rebel officers plying their men with black powder and whiskey before a fight. But there are many other camp anecdotes that do ring true, though, as with many Civil War memoirs, there are also factual errors and faulty interpretations sprinkled around. With rare exception, Shannon allows the writing to speak for itself in the book, with few editorial interventions of any kind. There are only 29 endnotes in total for the entire article collection. Midway through the book, Barnes interrupts his 20th Iowa series of writings to discuss the service histories of other Hawkeye units like the 2nd Iowa regiments of infantry and cavalry. Those sections merit less attention as the information provided is secondhand and the articles are mostly just campaign overview narratives (from both Union and Confederate perspectives). But, in the latter stages, Barnes returns to his own unit with a bang (literally). His detailed personal account of the catastrophic May 25, 1865 explosion of the main ordnance magazine in Mobile is fascinating. As the 20th was mustering out of service, Barnes was rewarded with a promotion to first lieutenant. Those that enjoy reading lively Civil War reminiscences penned by rank and file soldiers will certainly get one from J.D. Barnes. There's a wider interest level involved to be sure, but students of the Trans-Mississippi theater (particularly the war in Arkansas and Texas) will probably get the most out of Campaigns of the 20th Iowa Infantry.